Editors Note: Vijaya Ramachandran works with one of our project partners – Apna Skools (Jagriti Bal Vikas Samiti). For more, visit https://sites.google.com/site/apnaskools/. The views expressed are her own. Stratification of society – either based on religion, caste or economic status – has often been the bane of under-developed societies and countries. Our nation, while displaying a breath taking diversity in cultures, languages and religions, is also, unfortunately, one that is one of the most economically unequal. India is claimed to be “shining” because we have 1.2 Billion people, and so even if a small fraction of these people economically progress, overall growth, in a macro-scale, appears impressive – indeed, we boast inclusion of several Indians on the top one hundred list of rich people, along with an upper middle class with a potential purchasing power that could be as large as all of Europe. But these accolades have come at a severe cost – at the other end of the scale, we have the dubious distinction of having the largest number of malnourished children on earth, and the largest number of people below World Bank‟s poverty index for basic sustenance – in fact, a large fraction of India‟s population is well below the index level at which sustenance is supposed to be threatened. History has taught us that extreme income inequalities lead to terrible consequences, not just for poor, but for the middle-class, rich, and indeed, for entire society. For, extreme distinctions in purchasing or economic power lead to conditions that give rise to slavery and indentured servitude. Such conditions inevitably lead to massive social unrest, upheaval, and disintegration of society. The above conditions sound extreme – surely India, a vibrant democracy with all the “shining” it has been doing in the last decade(s) has no resemblance to dire scenarios of past centuries? Surely there are problems, but not systemic with the kind of rot that would encourage or sustain slavery-like conditions? The answer, in many pockets of India, and in many lines of work, is, unfortunately, yes. Here, we describe one such situation, but not just to document the enormity of this problem, or to just lament about it, but to describe it realistically, and then describe some possible solutions. Our response to this problem, in Kanpur, starts with a system of schools and hostels – Apna Skool and Apna Ghar. This is one small step to tackle a deep systemic rot in the system, but it provides clues on how to tackle the problem at more fundamental levels. Most of the construction work in India is done by ad hoc or temporary workers and the people who make bricks for our houses are, for the most part, bonded labourers. The process of them becoming virtual slaves is systematic. They start out as either landless farmers who get the right to grow crops on plots of land rented at exorbitant rates from local landlords or underemployed farmworkers. In both options they end up borrowers from the same local landlord or local moneylenders, often borrowing at usurious interest rates. This situation is highly exploitative but it is nevertheless somewhat sustainable. Disaster strikes when there is even a mild drought. Now this farmer or worker has to pay the exorbitant rent plus the interest, but his income through raising crops or his wages is hardly enough to cover. At this point, again, the local power wielders jump in to provide the loan to cover the earlier loan and he offers them a chance to pay it off by working in brick-kilns, construction sites and road building ventures far away from their own villages. These brick-kiln owners, Construction Contractors, Labour contractors and the local land lords/money lenders etc. collude and decide the amount of work allocated to each worker, the rate at which they are paid, the conditions of employment, etc., – the farmers-turned labourers having no voice or visibility into this process. They are sent off to far-off lands because this collaborative “team,” comprising the brickkiln owners etc. and the village overlords determine the location at which this loan must be paid off. The brick workers receive a net payment based on the total number of bricks during the season. There is no clarity as to whether the rates are as per the provisions of the minimum wages act, since the weekly „advance‟ in lieu of wages they receive has no relation to a regulated actionable wage structure. Since it is the final output that determines the earnings, the workers “willingly” put in long hours and subject themselves to adverse health consequences. In addition, to maximise output, the labourers‟ children are also “unofficially” incorporated into the work force. For example, donkeys, laden with dried bricks for transport between the fields and the brick-kilns are herded by young children, even toddlers, since this is a task deemed to not require any advanced skills. Employers cannot be held responsible for employing children, since their names don‟t appear in any register or wage bills. Finally, inclement weather or downturn in demand results in pay reductions, because, after all, the workers are not being paid for working in a job, but rather for their final output. There are many regulatory provisions in the interest of unorganized workers, and many acts, both centre and state administered, such as the Contract Labour Regulation and Abolition Act, 1970, the Building and Other Construction Workers Act, 1996, that could provide appropriate legal recourse from unfair practices. They could, in principle, ensure that unorganized workers receive fair wages, get regulated working hours, are accorded basic facilities such as temporary shelters at worksites, hygienic toilets and crèches for child and infant care while mothers work, proper safety tools, such as hard hats and protective goggles when necessary, proper gloves and requisite footwear etc. Unfortunately, as is often encountered in Indian, the laws are commendable while the reality is pathetic. Neither the application of statutory legal processes nor the monitoring by labour welfare departments appears to have had any noticeable effect in any aspect of these labourers‟ conditions. Legal provisions can often be bypassed through complex processes of recruitment using labour contractors and other such dalals as intermediaries. Ironically, if just a fraction of the laws, mentioned above, are duly implemented, bondedlabour may not be the scourge it currently is on our society. But laws are meaningless in the absence of enforcement, and history has taught us that enforcement needs organised demands from those afflicted by injustice. Brick kilns are typically sparsely located, with little contact between them. While the brick kiln owners have associations to collectively liaise with the various departments of government, on issues such as leasing permits, excise regulation, etc., there is no counterpart organisation for the brick kiln workers. No organized unions or labour bodies, such as the Centre for Indian Trade Unions (CITU), the Indian National Trade Union Congress (INTUC) or the Bharatiya Mazdoor Sangh (BMS) appear interested in including brick-kiln workers amongst their cadres, since they are not a visible, concentrated work force that can lend political power for the organization or become pliable vote bank. So, perhaps the first task would be developing organisation(s) that could provide generalized representation to all migrant labourers in our country. There are many social benefit programs of the government that attempt to target the underprivileged. However, poor migrant workers are seldom able to avail of these opportunities, mainly because they are neither properly enrolled in their original villages, nor at the worksite near the urban centre. It is envisaged that identification-schemes such as the Aadhar card, the Universal Identification Document (UID), the government has recently implemented, could solve a longstanding problem faced by migrant workers – that of claiming a residence or jurisdiction for claiming benefits. Armed with such a universally (within India) form of identification, they may be able to demand retirement benefits /health insurance contributions by the employers into a unique bank account not necessarily tied to a specific geographic location. Likewise, they may be able to draw their rations of subsidized staples notwithstanding their temporary nature of residence at the worksite. Unfortunately this population group is seldom aware of schemes such as UID or Aadhar. In addition, quite often, vested local interests are happy to keep the bureaucratic hurdles in joining such schemes insurmountable. It is interesting to note, however, that political parties are interested in getting them enrolled as voters, and so voter registration is often more widely implemented than any of these other schemes. Perhaps one way to ensure migrant labour participation in UID and Aadhar schemes is to tie it up with voter registration? A sustainable solution by focusing on the children, instead? We describe our experience with migrant workers who land up in Kanpur and the adjoining neighbourhoods. In the Kanpur area brick-kilns, the labourers come mostly from Nalanda, Gaya, Ranchi, Hamirpur and Chhatisgarh. We have worked over 30 years with these groups to help them navigate the very complex loaning and legal obligations that have currently put them in a state of virtual slavery. Frankly the real solution is to try and ensure that the next generation does not get similarly trapped, because the local landlord goes to great lengths to make this loan obligations roll from one generation to another. The main activity we are therefore engaged in is primary education from class I to V at all the Brick-kiln centres we are able to access. Initially, there was lot of opposition, both from the labourers and the brick-kiln owner; the labourers because sustenance depends on maximising the number of “hands on the job,” and the brick-kiln owners, because they are suspicious of any endeavour that might empower the labourers. Akin to the problems faced by the migrant labourers in securing government mandated benefits due to the lack of a permanent address, their children miss out on opportunities to obtain basic education and literacy. While the objective of the government in enacting the Right to Education (RTE) Bill is to universalise primary and secondary education, the children of the migrant workers miss out on the associated enrolment drives because they are not present, over an entire school year, in either their village or the brick-kiln sites. Our efforts to enrol the children in government schools close to the brick kiln sites leads to two problems: (a) many brick kiln sites are in remote areas, and the nearest primary schools can be a few kilometres away; (b) since the children are in Kanpur for only approximately half a year (and then they return with their parents to their native villages), government schools are unable to adjust, satisfying these part time students (the RTE act mandates that schools cannot refuse admission to any child of school going age, but this is yet another case of a beneficial law with little enforcement). Thus, there is a critical need for multi-pronged proactive measures on order for the benefits of the RTE act to reach the children of migrant workers. The Basic Shiksha Adhikari (BSA) – the district level officer in charge of implementing RTE locally – needs work with school administrations to ensure that admission for these students is not denied; a public transportation system is needed to transport children to/from brick-kilns and govt. schools, possibly via private initiatives by the brick kiln owners; and lastly, and most importantly, the migrant labourers need to be convinced of the long-term benefits of their children‟s education. In addition, since these children are often first generation learners, it is imperative that “education” involve innovative approaches including nonformal supplementary learning processes, both in order to get a sustained impact as well to make schools an enjoyable social experience. Apna Skool study centres represent the evolution of 30 years‟ worth of our efforts in this direction, and our long-term hope is to replicate them wherever there are migrant workers – not unlike the central government led network of Kendriya Vidyalayas that offer continuity of education for the children of central government jobs that are geographically transferrable. 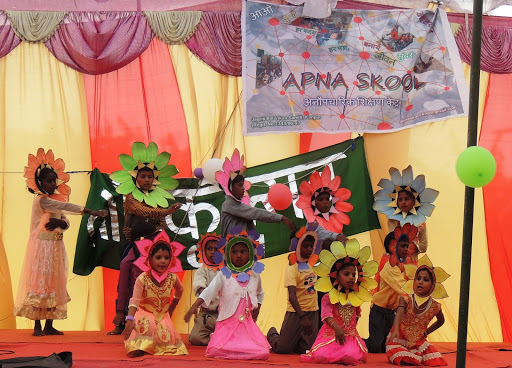 Apna Skools bring the joy of schooling in its onsite centres, wherever there are a sizeable number of children at brick-kiln sites. Our dedicated coordinators have developed a syllabus that introduces the three R‟s (Reading, wRiting and aRithmetic) to first-generation learners, employing various methods proven to yield a joyful learning experience. While the curriculum covers syllabi in typical mainstream schools, the additional, critical emphasis is for the children to develop hygienic habits while also becoming responsible, informed citizens. The teachers are asked to not only play the role of classroom instructors, but also act as personal mentors for children who have never experienced life in a classroom. The innovative approach encourages children to develop their talents to compose and recite poems, storytelling, enacting skits and dramas, and displaying their interests as artists, dancers and musicians. Through developing street plays, composing poems on combating social ills in society, and participating in local drives related to environmental awareness, the children gain literacy while becoming agents of social change in their generation. This work is supported by regular grants from ASHA for Education (the Silicon Valley, US, chapter), the Association for India Development (AID, Portland, US, chapter), VSEI Canada, the RV Foundation, Chennai, and several individual donors, Thanks to generous support from Belgium based Mala Foundation, hot nutritious mid-day meals are made available to all children at Apna Skool sites. As of this writing, there are more than 25 such centres educating more than 800 children. The migrant nature of these labourers and their children necessitates interruptions of the school year and there is no guarantee that the children come back to resume where they left off (when the parents return to brick-kilns following the seasonal nature of this work). In several cases, the task of educating these children needs to begin from scratch. Moreover, many families do not return to the same brick kiln or to one we are running Apna Skool centres. To address this lack of continuity in education, our organisation has undertaken more pro-active steps. Where feasible, our co-ordinators go to the villages in Bihar or Eastern UP (from where the majority of migrant labourers hail) and facilitate the enrolment of these children in their village schools. In addition, we employ a local tutor to provide teaching aids and training to enable the wholesome education as is the aim of Apna Skools (to avoid the pitfalls of rote education, as is unfortunately imparted in several regular government schools). Yet another innovation was to run a hostel for promising youngsters to continue beyond primary classes and pursue education in mainstream schools, while learning to be responsible youth developing into model citizens with social commitment. Apna Ghar, under the aegis of ASHA Kanpur chapter, started with 12 children drawn from amongst the most promising Apna Skool alumni. This hostel was initially run on rented premises in Nankari (a village adjacent to IIT Kanpur). Recently, owing to another generous grant from the Mala Foundation, we have acquired property and built a hostel complex, complete with room, board and educational facilities, to accommodate up to 100 students. This complex will serve as a residential complex for the 100 students, as well as the major centre for Apna Skool. By Spring 2013, we expect to have 25 students residing at Apna Ghar, and we expect that schooling for classes 3 – 5 would be run for all children from brick-kilns across the Kanpur Dehat region. This will economise operating the 25 (and growing number of) centres, since older children will require better equipped classrooms (younger children, attending classes 1 and 2 will still be taught at the on-site Apna Skool centres, since transporting large numbers of young children from each brick kiln to the consolidated center at Apna Ghar would represent a logistical challenge). What impact, and where do we go from here? A 30-year effort notwithstanding, we are convinced that these activities have already had a positive impact. After acquiring basic primary education in Apna Skools, many children have gone on to pursue further education in mainstream schools, such as Swami Vivekanand Vidyalaya at Lodhar, run by Jagriti Bal Vikas Samiti near IIT Kanpur, the Jawahar Lal School and Inter College at Kalyanpur, and the Ramakrishna Mission School, Gumti, Kanpur. Apna Skool liases with all the aforementioned schools, and arranges suitable scholarships for the continuing education of these children. A couple of children have gone on to become school teachers themselves in their villages. Another has become a successful entrepreneur – a small scale manufacturer in Bihar – creating job opportunities for people in his native village! lead to a social movement that would help remove the scourge of bonded labour in India. Of the 3 Apna Ghar students within two years of graduation from school, one aspires to go back to his village to solve the problem of alcoholism there, another wishes to become the headmaster of the network of village schools in his rural district, and a third wants to become an engineer – these attitudes are a sea change from the previous generation, that knew no better than to acquiesce to another generation‟s worth of bonded labour. The objective of RTE is to ensure that all children between the ages of 6 and 14 years have access to quality education. Primary and secondary education is now one of the fundamental rights guaranteed by the Indian constitution. We look forward to a day when every single child, wherever they are, have access to quality education. Until then we need many structures, such as Apna Skools and Apna Ghars, to make the transition. Ultimately, the scourge of bonded labour will be removed only when a generation of literate, educated, as well as socially responsible men and women enter the labour force, and hence the paramount need to educate and socialise the next generation of India‟s underprivileged socio-economic class of people.